How can one of the great movies of 2010 not be shown in theaters? Mother and Child is one of those rare movies that is nearly perfect in every way that counts - acting, story, dialogue, editing, directing. An independent film, it probably didn't show at a theater near you. Written and directed by Rodrigo Garcia, this story about the love of a mother for her child is told from the perspective of several relationships, each unique and full of surprises. Annette Bening is magical in the role of a difficult, fifty-year-old woman who when she was 14 gave up her child for adoption and has been haunted by the loss ever since. She deserves the Oscar for it, but she probably won't even be nominated. 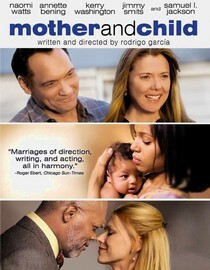 Other great performances: Jimmy Smits, Samuel L. Jackson and Naomi Watts. Warning to Netflix junkies - no gun battles, no chase scenes, no suspension of disbelief, no special effects. But it's a must-see if you like realistically told, moving stories about relationships. I heard this one was good, Denny. Thanks for the tip. I didn't realize it was out on DVD. This sounds like my kind of movie. Thanks for the rec, Denny. Moved it to the top of my queue. I hasn't heard of it, but I think I would really enjoy it. Thanks!